We’re less than a week away from THE award show of the season, the 83rd Academy Awards. As a movie buff, I make an effort to watch every year. I get a kick out of the unscripted moments (Adrien Brody smooching on Halle Berry after winning best actor for The Pianist) and the acceptance speeches that come from the heart (last year, Kathryn Bigelow was poised and inspiring accepting her best director win). And of course, I enjoy watching all the beautiful people and criticizing their attire. In the spirit of the award season, I’m honored and pleased to announce that OINKtales was named by Alison over at The Other Winnie Cooper as being an Awesome Blog and Darla of She’s a Maineiac as being a Stylish Blogger. Thank you both! OINKtales is grateful to accept your awards and wants to reward your kindness by reciprocating. You are both awesome and stylish bloggers too! And while I am truly flattered to receive these awards, my cynical side is clamoring for satisfaction. I have to make the following observation: Blog awards are the new chain letters. Do you remember being a kid and getting that hand-written note from your cousin that promised if you mailed a sheet of stickers to some unknown person on a list and then copied the note exactly and forwarded it to twelve of your friends and family, you’d end up getting reams of stickers? Did you ever get any? Do you want to guess whether I did? In college, I did do a lingerie chain (new, not used!) and it was moderately successful (I got a whopping three pairs of undies this way) and within the last couple of years, I bought into the Facebook chain where you announce random facts about yourself (being petrified by the idea that vampires might actually exist is my #25). But overall, I have broken more chains than I have extended them, for which I understand that I have been penalized a lifetime of bad luck. So here we go: The requirements for accepting these awards are to link back to the awarders, list seven things about yourself, and then pass the award on to other worthy bloggers. I’m supposed to list fifteen but I don’t follow directions well. I don’t like to talk about myself. So ironic, since I can blog about intimate things in my life (tampons of preference, hello?) but when I am in a group – and sometimes even one-on-one – I tend to downplay my accomplishments and make light of things that are important to me. Any couch psychologists out there? I think kids are disgusting. But they’re like pets. When they’re yours, you love them even when they’re disgusting. Every day, I consider going back to my old job. Or trying to. It’s not like they’re saving one for me (wouldn’t that be nice?). Every day, I daydream about winning the lottery. Although I’d take less than a million, it’d be hard to accomplish the basics with less than that. Lest you think I am greedy, consider that I have three children to put through college and probably, grad school. I am an escapist reader and my favorite genre is young adult fiction a la The Hunger Games, The Golden Compass, and anything with Potter in the title. I have two belly buttons. At least, it looks like I do. This is what comes of keeping one’s belly button ring in when one was hugely pregnant. Not. Pretty. And though this last bit I suspect you already know, I’m including it anyway, if only to end this list: My family means everything to me. OINKdaddy. My better, happier half’s observations on our life. Push the Envelope. Watch it Bend. A brand-new running/fitness blog authored by my uber-fit brother-in-law (an OINK to follow on this one). She Rides, I Pay. For funny, horsey folks. My Topography. Beautiful. Lyrical. Words and pictures. Saying YES 2 boys and Life. Humorous, homesteading, homeschooling mom. The Ramblings. Prolific blogger whose hilarious descriptions strike a chord with many. Scary Mommy. Blogging maven who has never heard of me but who is laugh out loud funny and who has her own scary mommy society (it has an eight-week waiting list!). Theta Mom. Another blogger who has never heard of me but who, like Scary Mommy, started her own blogging community and is highly supportive of other bloggers. And of course, the aforementioned She’s a Maineiac, a new blogging friend who writes about the loopy world of a desperate Maine housewife, and The Other Winnie Cooper, one of my BFF’s who considered participating in the underwear chain and who is now the larger-than-life voice of a 12 pound shih-tzu. Although I have been hoodwinked into a few chain letters promising recipes! Congrats…you deserve it…your blogs always bring a smile to my face! Thanks Melissa! So glad to have you as a subscriber and a reader! Darla, I very much appreciate the award – I hope you were not offended by my casual cynicism (Alison, I think, is very much used to it). I just could not resist the chain-letter analogy! 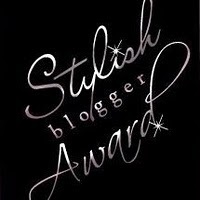 That said, bloggie awards ARE cool ways to introduce people to other blogs and much flashier than a boring old blog-roll. I love your blog too and relate to just about everything you write! Thanks again. Oh, no, not offended at all! 🙂 It takes a lot to offend me. LOL I totally get what you’re saying and completely agree with it. I had the same reaction, you just put it down in words much better than I could! Cheers and thanks again! I am lifting a virtual glass of very nice wine (you prefer red, right?) in your honor. To you! Girlfriend, after writing this post I drove my kids to swim at the gym. On the way there, I realized I hadn’t brushed my teeth today. It was 3 pm. How stylish is that? And just between us and our readers, I was in a “speling bea” too. I came in third. Damn c-h-o-l-e-s-t-r-o-l. Totally surprised to see myself mentioned here, or anywhere near the word “Stylish”, so THANK YOU! Yes, the chain mail analogy is appropriate, and there is a 50/50 chance that I will break it, but who knows, maybe I will join in! You are totally stylish and funny! Great list of blogs, I love checking out new blogs! « What’s the Dealio, Johnson & Johnson?